Obesity is still prevalent in both Western countries, and increasingly – in the East as well. However, the key to understanding health and natural remedies still lies prevalently within the Eastern culture, with its wise health gurus, Shamans, and witch doctors, who have been using the properties of medicinal plants for centuries. Yes, one of these plants is easily found in your nearest health food store; it is the sunny flower named the dandelion. Dandelion tea benefits are varied and help several health problems. 1. Dandelion tea promotes healthy digestion by cleansing the bile ducts. The root itself is a very detoxifying herb and removes waste products. 2. The root facilitates the removal of waste toxins from the body accumulated through polluted foods, water and air. This compound is additionally used to prevent and break down gallbladder stones. 3. The dandelion is beneficial for constipation. Dandelion is well known for being the best herbal laxative tea, and can be used to encourage bowel elimination. 4. One of the secondary dandelion tea benefits is that it’s useful for skin conditions such as acne and eczema. 5. And of course the dandelion leaves are a natural diuretic. So the colon and kidneys are cleaner and function much better. In most cases, herbal laxative tea is better than using over -the-counter laxatives. It is more natural and does not rob the body of potassium. The main ingredients that herbal laxative teas usually contain are Senna leaf and stem, licorice root, ginger root, dandelion root, Rhubarb and senna seed. Ginger root aids in speeding up the body’s metabolism and raises heat, while licorice has been known to reduce LDL cholesterol levels. Senna leaf is a risky laxative. The problem with Senna leaf is that it promotes weight loss mostly through water loss, and it promotes very frequent bowel movements. It is not the best way to lose weight because some foods might not even be absorbed and digested properly before being excreted, resulting in a very bad loss of vitamins. This is a no- no for your organism. Interestingly, Argentineans suggest that the best tea for weight loss is Yerba Mate tea. It comes from South America and is a spicy herbal brew. This tea shrinks appetite. In research labs, one group was given supplements spiked with Yerba Mate and these people lost over 10 times more than people with a regular vitamin supplement. 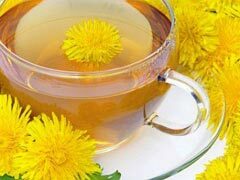 Dandelion Tea - Diuretic Miracle or Dirty Weight Loss Scam?